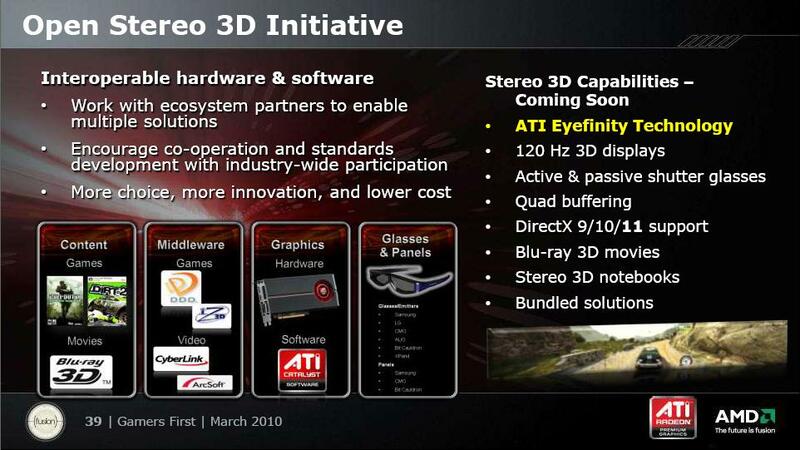 ATI has been talking about their upcoming stereoscopic 3D support utilizing 120Hz LCD monitors and active shutter glasses for quite some time already, and although we expected a complete working solution as early as this summer, things did not work out so well. So now, according to an interview with ATI made by Digital Versus we are going to wait a few more months (second half of the year), but we should see the complete working solution before the end of the year, maybe just in time for Christmas. Now when talking about openness, ATI is open to supporting different standards and hardware, along with middleware software, but in the end you will most likely be required to have an AMD/ATI-based video card in order to use one such solution. This is of course normal, as ATI will want to sell you their hardware as well as Nvidia does, to use when watching any kind of stereo 3D content. So although ATI in general seems to be more open, the end results seems to be not that different than what Nvidia is doing with their 3D Vision product. You can say that a really open approach is what companies like iZ3D and DDD are doing with their drivers/software that do support multiple stereoscopic 3D solutions and work on all video cards, no matter if they are based on ATI or Nvidia GPUs. What we actually need are standards that will allow interoperability and the users will not have to think now do I have a compatible video card for that solution, or will this 3D monitor work for me or not, or what shutter glasses should I get. And example that I’ve been seeing a lot lately of not having good interoperability that is confusing the users and making them wonder why is the fact that they cannot use their 3D-capable monitors and 3D DLP projectors to display 3D content from their PlayStation 3 console. The reason for that being that the PS3 sends the stereo 3D signal to a 3D capable display according to the HDMI 1.4(a) stereo 3D specifications and not a single one of the 120Hz 3D LCD monitors is capable of understanding and displaying 3D content sent this way. Of course you need to buy a 3D HDTV to play stereo 3D games from your PS3 console, but then again you’ll also have to buy a 120Hz 3D LCD monitor for your PC, as you will currently also have trouble connecting and using your new 3D HDTV to your PC. So being an early adopter has its advantages, but also comes with a lot of disadvantages and trying to cover more things and work with more partners like ATI does not only means bigger delays, but might as well mean more problems. If you take a look at how much time the 3D Vision has been available on the market already and how Nvidia is having trouble to convince the hardware and software manufacturers to work on products that support it, not to mention that for more than a year and a half the software and hardware support is still far from being perfect. Now imagine what will be the situation when ATI’s complete stereoscopic 3D solution finally becomes available… I expect a lot of issues to be present at first and it will take some time for all of these to be fixed, and that is something that everyone of the early adopters of 3D Vision is well aware of. Now the 3D Vision already has a lot of users, has a larger community and this also helps a lot in reporting problem and improving the S3D support of the product. But ATI will need some time before reaching the critical mass of users that will have all the needed hardware and software and users that are willing to experiment, test and report issues, even make optimizations and workarounds for better experience etc. I agree, ATI’s solution will need some time before it will be as good as Nvidia’s. Hopefully it will also give some competition between Nvidia and ATI. Btw, as you have talked about before. There will properly be a Version 2. of Nvidia’s glass’s, with improved 3D quality. Theise glass’s might be realesed sooner, if ATI start to work with 3D also. – Ghosting(speciall the ghosting seen at top of the screen). Resident evil 5 has really much ghosting, and so do other games. – The darkness. There should be a way to make the picture less dark, deffently something that can be improved also. – Overall look. Maybe more then one model, and if they made them look abit like Sunglass’s. – Light reflection. The light is easily reflected into the glass, because of the surface of the glass’s. mickey mouse 3d 2010, TN Panels seems to be quite bad then.. but never the less, the glass’s still have ways they can be improved. And as far as i know, ghosting is caused when the glass’s isnt sync’ing the images to the right eyes correctly, and they overlap abit. im just playing at daytime light, it should be possible..
100:1 contrast is not exactly my “dream setup” . theres zero noticable ghosting with DLP and 3d vision glasses. I don’t know if competition is always that good of a thing. Remember HD and BluRay? Those two techs got locked in a battle that was close enough that nobody was willing to buy either one, for fear of buying a ‘betamax’. If ATI comes out with a strong but completely incompatible solution, we could get a similar situation. I’m hoping that won’t be the case here. As long as both just tap into DirectX and OpenGL (please NVIDIA!) then a gaming company optimizing for one will pretty much be optimizing for the other, too, with perhaps just a few tweaks needed. But if they somehow manage to make it so developers need to do completely different optimizations for each company’s 3D, we’re in deeeep trouble. no Ghosting!So I think the problem with Ghosting is not the Glasses!The Problem are the LCD Panels!